Concept originally came to light while I was browsing some Photoshop tutorials and ran across a burnt paper tutorial. 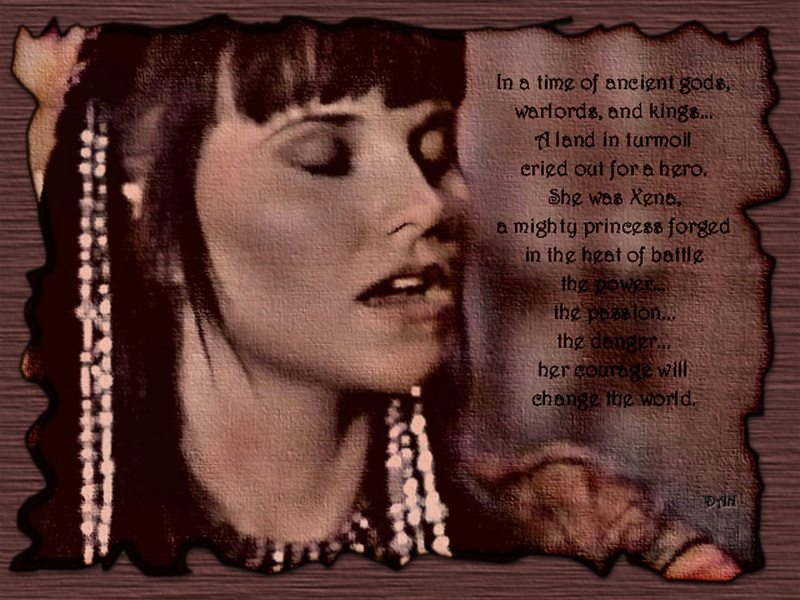 I decided to use the picture I drew of Xena some time ago. Ever since I first saw Livia, I knew I needed to make a wallpaper for her. Well, I finally buckled down and did a wallpaper of Livia! It's about time! :) Check the comments for more info on this design. I made this wallpaper for the abmxh newsgroup. 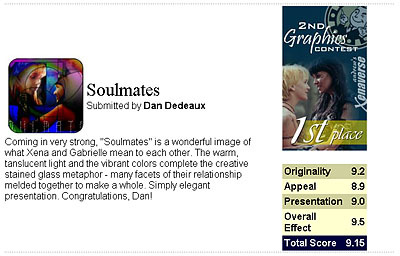 They put together a sort of contest. 5-10 images are provided and you come up with any wallpaper you can. No prizes :) It's just for fun to 'show your stuff'. I used 3 of the images provided for this design. As you may know, the most popular (scientific) theory on the beginning of the universe is referred to as the 'Big Bang'. Here, we have Xena and Gabrielle encased in a capluse of time, exploding from the center of what will soon become our universe. Sorry it's so large (file size). The character Najara made a huge impact on me in the episode The Crusader. And finally I was able to come up with (what I feel is) a fitting design for her. To learn a little more about the design, check out the comments...I used a scanned image from the net and a background image created with a freeware terrain generater similar to Bryce. Originally, Woven Legacy was created with a picture I 'spruced up' before I concieved this design. As such, the design wasn't accurate towards my intended design. So, I decided I needed to start this design from scratch and do it right. I think both designs look nice, but the new version fix's a couple things I didn't do with the original. Here's the old version.